Zurich North America called on CannonDesign to ensure the new headquarters is best-suited to meet its employees’ needs. 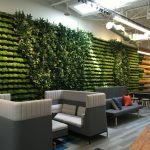 In an effort to meet the needs of their growing team, Zurich North America, an insurance and risk management company, created a new space for its employees flooded with natural light, social hubs, various neighborhoods, enclosed meetings, and a conference center supporting the entire facility. As a company that regularly hosts events, the space also reinforces Zurich North America’s commitment to protect, inspire, and help reach visitors’ fullest potential. One significant part of its new headquarters is the KAMP Remembrance Garden. A memorial that pays tribute to the employees lost during the 9/11 terrorist attacks. Each letter of KAMP represents the first letter of each employee’s last name. This KAMP Remembrance Garden is often visited by employees for walking breaks and fulfill another facet of KAMP: Keeping A Meaningful Perspective. This reinforces the lives and careers of the KAMP namesake. These two concepts are at the core of a suite of design elements that work to locate people within the large space, identify key areas, and create a comfortable human scale. There are conference rooms, enclaves and casual meeting spaces strategically located on each floor throughout the workspace. There are conference rooms, enclaves and casual meeting spaces strategically located on each floor throughout the workspace. The number and location of these spaces were informed by extensive employee engagement and analysis. That process revealed that Zurich employees would not use collaboration areas integrated within the open plan desking, thinking conversations there would be too disruptive to colleagues. This led to the creation of the social hubs—located in close proximity to the neighborhoods, but removed—for more casual collaboration. Enclosed meeting rooms immediately adjacent to work areas provide respectful areas for ad hoc team discussions, while a 46,000 SF conference center supports the whole facility. The HQ offers a conference center, auditorium, coffee bar/retail concourse, café/dining atrium and fitness center. The HQ offers a conference center, auditorium, coffee bar/retail concourse, café/dining atrium and fitness center. The Zurich campus also offers employees numerous terraces, walking trails and water features along with outdoor fitness courts. Profiled by leading publications including Fortune, Business Insider, Fast Company, The Chicago Tribune, and more. The project has also been profiled by leading international media for its design and the strategic workplace pilot that informed it. These publications include Fortune, Business Insider, Fast Company, The Chicago Tribune, and more. …extensive connectivity to public transportation. The Zurich HQ is located on a major thoroughfare in Schaumburg, IL with extensive connectivity to public transportation. Zurich also offers covered parking with charging stations for electric vehicles and bike storage for those who pedal to work. Zurich’s “C” suite was deeply involved in the project and design process. They articulated clear goals from the outset and guided decision making as the project progressed throughout the workplace pilot and design stages. They were remarkable advocates for their people and the Zurich brand. What kind of programming or visioning activities were used? Were any pre-planning surveys conducted to get employee input? Was there any other kind of employee engagement activities? Zurich partnered with CannonDesign to executive a workplace testing experience where 150 Zurich employees spent three months testing four uniquely configured office neighborhoods early on in the project. During the 12-week testing effort, employees split time between individual workstations and shared spaces throughout the pilot floor, all while testing different office furniture, meeting spaces, enclaves and conference rooms that could be incorporated into the HQ. Before, during and after the workplace test, Zurich employees provided feedback via employee surveys, observation, focus groups, and town hall meeting. [Testing] revealed key employee preferences for natural light, enclaves, and sit-stand desk furniture. Zurich’s commitment to engaging their employees so deeply was unique, inspiring and effective. This project raised the bar for what it means to engage staff in the design of workplaces. Yes, this was a core focus of the project. Tangible results of this emphasis can be found in the on-site fitness center, extensive access to nature + natural light, walking trails and more. The headquarters is designed to reflect the company’s global reach and world-class stature, introducing an architectural solution composed of three bars. The arrangement works in tandem with the interior environment to create unique spaces for collaboration, open views, and key flexibility and adaptability opportunities. …features numerous terraces, lawns, rooftop gardens, water features and walking paths to further enrich the employee experience. Clarity and protection. These two concepts are at the core of a suite of design elements that work to locate people within the large space, identify key areas, and create a comfortable human scale. Most are executed in wood imbuing the space with warmth. The veneers are composed of angled facets that promote the idea of the beacon’s emanating light, also referencing a base building detail. For brevity, we will touch on a few emblematic moments deploying those design elements. The concierge area, situated adjacent to the main entrance and the three-story volume over the café, is defined by a sheltering wood ceiling element that makes the scale more intimate. The 300-seat auditorium shares that feeling of intimacy, the wood creating a protective enclosure around the audience. With the coffee bar, the wood instead becomes a sculptural object within the larger space. Located at the building entrance, the coffee bar is an iconic statement that sets expectations for what will follow—a welcoming beacon to employees, customers, and guests. Outside, the new Zurich campus includes a memorial garden to honor the four Zurich employees who died in the September 11 terrorist attacks. It also features numerous terraces, lawns, rooftop gardens, water features and walking paths to further enrich the employee experience. The most defining aspect of the project was Zurich’s commitment to its employees. Beginning with the project’s incredibly robust engagement process, that same care continues with the campus itself. From the breadth of its amenities, to how the workplace itself is planned—all are responsive to employees saying what they wanted from the new headquarters. There is a recreation center, green roof space with gardens, 13 acres of native landscaping, walking trails, courts for volleyball and basketball and extensive access to natural light and nature. Change management is a critical and oft-overlooked aspect of workplace success. Zurich embraced change management throughout this project. The company focused on educating employees about all the benefits, resources and possibilities the new space provides. Following the workplace testing experience, Zurich tapped 160 employees as Change Champions to help make the workplace move a success via change management best practices. The company has also begun implementing changes across other US offices in response to the research and data acquired in the workplace test. If so, what were the most surprising or illuminating or hoped-for results? Satisfaction with the new HQ is at 83% (an increase of 30%) for all employees. The industry benchmark is 60%. Over 78% of Zurich employees feel the ability for work flexibility has increased with the new building. If a change management program was in place, what were the most successful strategies? Establishing change champions early on and empowering them proved very successful for Zurich. Interior Builder: Executive Construction, Inc.